Audi announced that it will bring a new concept car to the Frankfurt motor show in September - and this concept will feature OLED lighting tail lights. As always, Audi says that OLED provides a thin, efficient and low-heat light source, while achieving a new level of homogeneity while opening new design possibilities. Audi calls this new design 'Matrix OLED technology". From the prototype photo above, it seems that they will use transparent red OLEDs placed one on top of the other. Then again this may be just a design sketch, we'll have to wait for September to know for sure. In any case, this will just be a concept car and yet-another OLED automotive prototype. Audi does plan to include OLED lighting tail lights in the 2017 A8 Saloon car. Hopefully the 2017 A8 Saloon will be the first car on the market with the new lighting technology - unless BMW beats them to it. 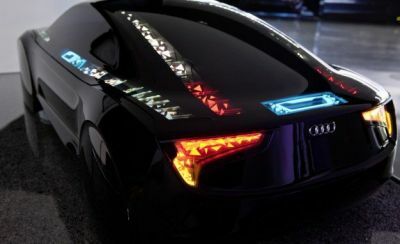 Audi has been playing with OLED technologies for a long time.Back in 2012 they unveiled three new OLED lighting designs, and in 2013 they unveiled 3D OLED lighting taillight prototypes (developed with Philips and Merck). In 2012 Audi also installed AMOLED digital rear view "mirrors" in their R18 sports prototype cars. It'll be interesting to see if the upcoming A8 will use one of these designs.